The Econo-O-Lift™ bucket elevator line’s robust construction is built for durability and easy installation. 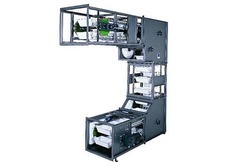 It features a collapsing chain and 360-degree discharge with multiple discharge and inlet feeds for maximum flexibility. Gough Econ is the only licensed global manufacturer of the Elecon™, the world's only bucket conveyor that can move materials in any direction. No other conveying system in the world is as flexible as the Elecon. 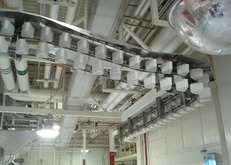 In addition to the typical vertical and horizontal movement, the Elecon bucket conveyor can make right or left turns. This multi-axis capability is a result of its patented chain design and wedge-shaped buckets. Dubbed as the “go anywhere” bucket conveyor, the Elecon minimizes your conveying system's footprint and can handle virtually any circuit design imaginable. 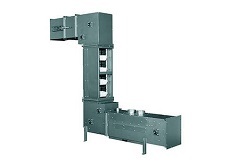 Bucket conveying systems offer solid solutions in the transportation of bulk material. More importantly, the market demands for new products, and quick and efficient product switch overs, has created a much greater need for flexible alternatives in the way bulk materials are transported. The Elecon is the world’s only bucket conveyor that provides businesses with the alternative to fit a conveyor system into their existing facility without having to change the facility to accomodate the new system. Gough Econ utilizes the most robust construction and components in the industry to ensure the reliability and durability of our Swinglink bucket conveyors and elevators. Swinglink bucket elevators remain upright throughout the handling process to safeguard the integrity of your product. Smooth bucket surfaces eliminate product trap areas while the clean-in-place capabilities of the Swinglink provide for maximum cleanliness. Gough Econ utilizes the most robust construction and components in the industry to ensure the reliability and durability of our Swinglink bucket elevators. The continuous chain and bucket design with overlapping bucket lips contribute to the adaptability of the Swinglink. With the strongest chain in the industry, the Swinglink provides durable, yet gentle, handling of a range of industrial goods.